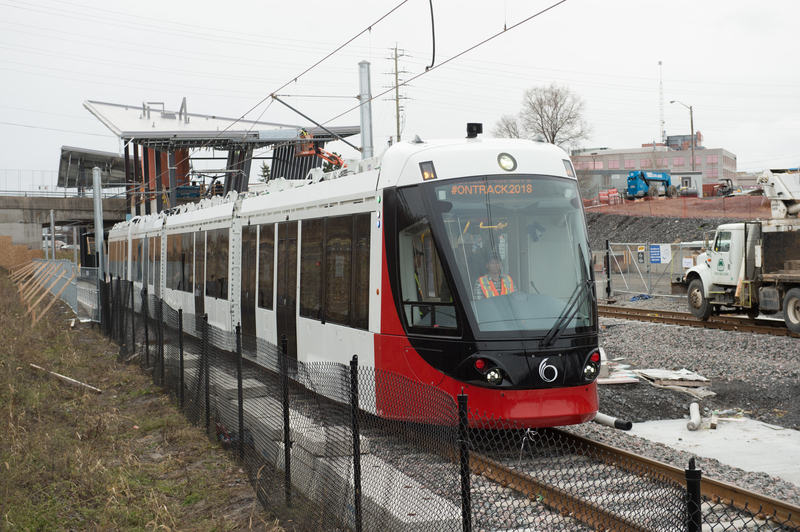 Ottawa – A major milestone in the O-Train Confederation Line Light Rail Transit (LRT) project was celebrated today as the first light rail vehicle (LRV) assembled in Ottawa began testing on the track between Blair and Cyrville stations. Vehicle testing along the alignment from Blair Station to Tunney’s Pasture will continue until the launch of the O-Train Confederation Line in 2018. David McGuinty, Member of Parliament for Ottawa South, on behalf of the Honourable Amarjeet Sohi, Minister of Infrastructure and Communities, the Honourable Steven Del Duca, Ontario Minister of Transportation, and Ottawa Mayor Jim Watson, along with other dignitaries from all levels of government, participated in a photo opportunity with the LRV in celebration of this milestone. The O-Train Confederation Line is a $2.1-billion project that is jointly funded by the Government of Canada, the Province of Ontario and the City of Ottawa. The Government of Canada is contributing $600 million and the Province of Ontario is contributing up to $600 million. The City of Ottawa will also allocate up to $161.5 million of its federal Gas Tax Fund transfers to this project and $287 million of provincial gas tax transfers. The remaining project funds will come from development charge revenues and transit reserves. The Rideau Transit Group is the private sector partner responsible for this first stage in Ottawa’s future rail network. The 12.5-kilometre electric light rail line will provide rapid transit between Blair Station in the east and Tunney’s Pasture Station in the west and will connect to the O-Train’s Trillium Line at Bayview Station. The route includes 13 stations and a 2.5-kilometre tunnel that will reduce congestion through the downtown core. 33 of 34 Alstom CITADIS light rail vehicles (LRVs) are being assembled at the Maintenance and Storage Facility (MSF), located on Belfast Road. Vehicle and system testing began this fall and will continue up until the launch of the O-Train Confederation Line in 2018. One of the initial tests is related to dynamic envelope testing where foam pads are affixed to the vehicle as it runs along the alignment – powered by the Overhead Catenary System (OCS) – to ensure that adequate clearances are maintained from overhead wires, OCS poles, tree branches etc. Residents will see rail vehicles travelling varying distances for testing purposes with no passengers on board. Residents are reminded to stay off the tracks and not to trespass on the alignment, as energized OCS and moving vehicles are hazardous. Vehicle movements will continue at low speeds between Blair and Cyrville stations to enable testing of the functions of various components of the vehicle and systems. Some of the final panels and markings on vehicles will be added in the later stages of testing. Testing will be ongoing as required until 2018, giving residents many opportunities to see the vehicles on the test track (Blair Station to just east of Tremblay Station) initially, and later along the whole alignment. Approximately 100 jobs have been created in Ottawa for the assembly of LRVs.